Does anyone remember Martha Stewart's Healthy Quick Cook ? It was published in 1997, and I’m not sure how popular it was. I got a copy when it first appeared and cooked from it frequently. I remember trying the vegetable handrolls, the hot and sour broth with shredded chicken, the apricot-glazed chicken, the warm wheatberry salad, and the sage egg-white frittata, and all were delicious. Also, the open-faced seared tuna burger with wasabi mayonnaise became a much-repeated favorite of ours. Then, for some reason, the book sat untouched for years. Last week, I wanted to plan some light meals with fresh flavors for the weekend, and I finally opened this book again. It’s divided into seasons, and 13 entire menus are presented for each. What I chose was actually from the spring section, but I think it worked fine as a summer meal. The complete menu was: wine-poached chicken with charmoula and couscous, chopped salad with tarragon vinaigrette, and Moroccan pudding, but I only made the chicken, charmoula, and couscous. This was my first time making charmoula which is a Moroccan sauce or marinade used on fish or meat. It’s spicy, packed with fresh herbs, and was just the kind of thing I wanted for dinner. This particular recipe for charmoula, as I’m sure there are infinite variations, was very simple. Garlic was minced, parsley and cilantro leaves were finely chopped, and all of that was mixed with cumin, paprika, cayenne, lemon juice, olive oil, tomato juice, and salt and pepper. That was easily prepared in the time it took for chicken breasts to poach in white wine with black peppercorns and cilantro sprigs. The couscous recipe in the book included only turmeric as an added ingredient, but I chose to stir in some baby spinach leaves and sauteed, sliced garlic as well. Since experiencing the best couscous ever earlier this year, I had to mimic it with the sauteed garlic. This time, I used a scant bit of olive oil for sauteing rather than half a stick of butter and used whole wheat couscous, but it still had great flavor. I always like what happens in a sauce when tomato juice is combined with lemon, and the charmoula offered that zing along with bold spice and fresh herbs. The raw garlic mixed into the other flavors well and didn’t dominate as it so often does. I was perfectly happy with the poached chicken and its simplicity, but Kurt informed me that while it was fine, he prefers the texture of grilled chicken. He'd never mentioned that before. Coming to think of it, he may be becoming pickier about food than I am. We did both agree the sauce was excellent and would love to try it with grilled fish next. I love love love Chermoula. I put this on everything from meat, poultry, or fish/shellfish. Delicious! I also love Chermoula, and hey, Martha does have some talent out of her jail stripes..lol All kidding aside, your plating, the dish itself, the photos, look spectacular and mouth watering. I wish you could deliver that plate to me for dinner tonight! The chermoula suonds really falvourful with all the herbs and spices! Lovely dish. I love moroccan food, gotta try this one. Plus if its a martha stewart recipe it must be fab (i totally love her). The charmoula sounds delicious! I must give that a try. I'm sure it went very well with the chicken and cous cous. I'm actually craving some cous cous right now. Never had charmoula, but fresh herbs are our favorites. Absolutely, positively. Sounds really good. i have that book, too! there are a coupla soups that i make each year from it. it's funny, when you find a few favorite recipes in a book, sometimes it's easy to forget there are other recipes in it, too. this looks healthy and refreshing-thanks! Haven't made this one, but I wanted to say that the chive vinaigrette with honey and mustard in the front of the book is one of my favorite salad dressings of all time! That sauce looks interesting. I guess it is time I start experimenting with Moroccan cuisine. 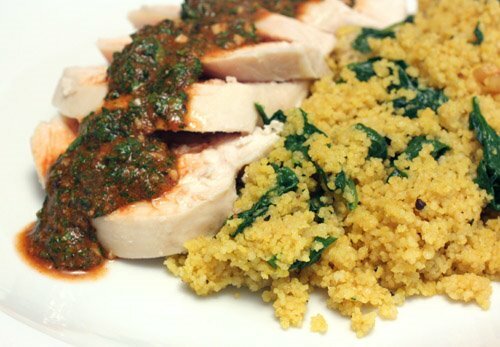 what a delicious looking dish, love charmoula and couscous - combos I adore but sadly do not make all that often. I can't wait to try this recipe. 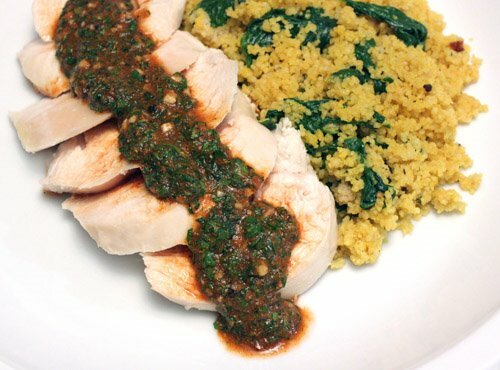 We grill chicken a lot but I like the combo of the poached chicken with the charmoula and the couscous. i can't believe i've never had charmoula. that's ridiculous, as it seems to contain ingredients that i adore. so glad you've introduced me to this!! That sauce sounds amazing, reminds me a little bit of the Chimichurri i am hooked to now, but more flavorful. Moroccan cuisine is so healthy & so full of flavors! Oh I can see the sauce makes the chicken very happy. It sounds really delicious!! !The chicken looks really tasty..
Lisa, it's true when tomatoes and lemon juice are combined, they bring out an excellent flavor. What a beautiful dish. Thanks for visiting my blog. The charmoula sounds so savory with the garlic, paprika, cayene,lemon and other spices! It sounds delicious! I love your site, it keeps introducing things I never heard of and that look totally amazing. An excellent dish & I adore chermoula!! This looks like a lovely dish! All the components look like they go very well together. I've never had the charmoula sauce before. Sounds very flavorful! You've just taught me about charmula. Never heard of or had it before. Now my interest is piqued. Looks like this is a great way to cook chicken breast while keeping it moist. All the components look really good together. I love healthier dishes like this that are so full of flavor. I have never tried charmoula before, I am intrigued. I've never tried charmoula, so you totally have piqued my interest! And healthy, to boot! I can't wait to try this! I love chermoula because it's so malleable- like ras el hanout, there's no official recipe, and it can even swerve over into chimichurri territory pretty easily. I have never made charmoula before but it looks great! I have never seen charmoula before -- thanks for introducing me to a new ingredient. Great photos too! I've never heard of charmoula, but I bet I'd love it! Looks very delicious & now I'm intrigued by this cookbook. The charmoula sounds wonderful! I love couscous too - yum! This Charmoula is so wonderful. I have to make this. I seem to like most dishes you make : ) Best couscous??? Must make this after my detox week. I am craving for some real food!!!!!!!!! I've never heard of charmoula! It looks so delicious!